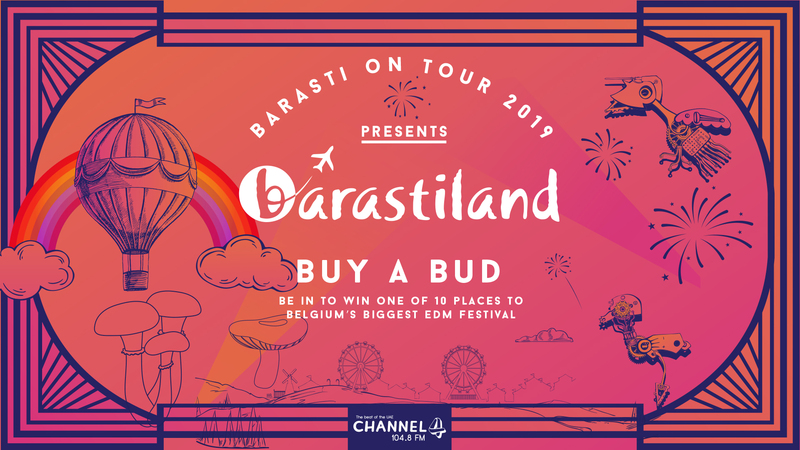 We’ve teamed up with Barasti to give you the chance to win your way to Europe’s Biggest EDM Festival in Belgium, this July. This amazing trip includes flights, hotels and festival tickets and you could be there! Every day, JJ & Nimi will be announcing our Barastiland Banger. When you hear the song in full on 104.8 Channel 4, all you need to do is text the word Barastiland to 6887 and you could win a flag and free drinks at Barasti every day - through to the grand final on 1st May when you’ll compete for one of 8 trips to Europe’s Biggest EDM Festival. Listen to JJ & Nimi weekdays from 6am for more details! The following rules together with the general and competition terms and conditions apply to Barasti On Tour competition which will run from Sunday 7th April to Wednesday 1st May 2019. What happens once I have won a Barastiland flag? Each Barastiland Flag winner will be entitled to three beverages per day at Barasti from the date of winning through to the grand final on May 1st. All finalists will need to be in Barasti at 6pm on 1 May to participate in the final. Contestants must be 21 years of age or over to enter. Barastiland flag holders must hold a valid passport and should be eligible to enter the EU/Belgium. Barastiland flag holders’ visa and travel insurance costs are for each individuals account and the responsibility of applying for the visa will also be for each individual. You must be able to travel to Belgium from 25th – 29th July 2019. All employees and family members of the promoter and/or sponsors are not allowed to enter into the competition. 3.1 We reserve the right to review and revise our terms and conditions without giving prior notice and by participating in the competition subsequent to any revision of our terms and conditions; you agree to be bound by such changes.